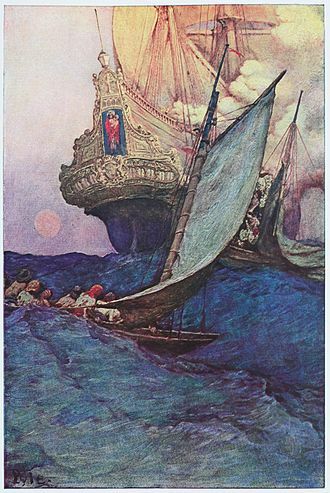 Treasure being divided among pirates in an illustration by Howard Pyle. A pirate code, pirate articles or articles of agreement were a code of conduct for governing pirates. A group of sailors, on turning pirate, would draw up their own code or articles, which provided rules for discipline, division of stolen goods, and compensation for injured pirates. 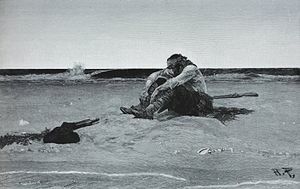 A marooned pirate, according to Howard Pyle. Buccaneers, like other ships of the time, operated under ship's articles that, among other things, governed conduct of the crew. 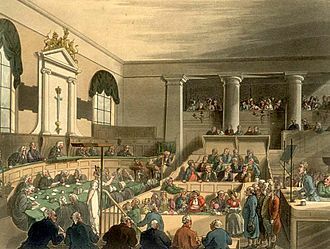 These "articles of agreement" became authority independent of any nation, and were variously called the Chasse-Partie, Charter Party, Custom of the Coast, or Jamaica Discipline. In retrospect, these became known as the Pirate's Code. Pirate articles varied from one captain to another, and sometimes even from one voyage to another, but they were generally alike in including provisions for discipline, specifications for each crewmate's share of treasure, and compensation for the injured. Each crew member was asked to sign or make his mark on the articles, then swear an oath of allegiance or honour. 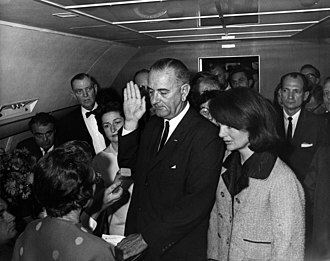 The oath was sometimes taken on a Bible, but John Phillips' men, lacking a Bible, swore on an axe. 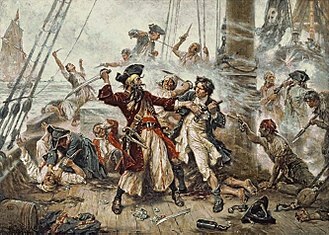 Legend suggests that other pirates swore on crossed pistols, swords, or on a human skull, or astride a cannon. This act formally inducted the signer into the pirate crew, generally entitling him to vote for officers and on other "affairs of moment", to bear arms, and to his share of the plunder. The articles having been signed, they were then posted in a prominent place, often the door to the captain's cabin. After a piratical cruise began, new recruits from captured ships would sometimes sign the articles, in some cases voluntarily, in other cases under threat of torture or death. Valuable sea artisans, such as carpenters and navigators, were especially likely to be forced to sign articles under duress, and would rarely be released regardless of their decision to sign or not. 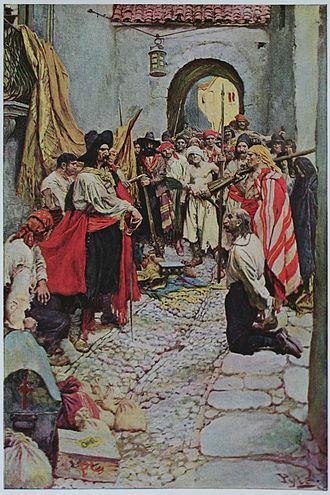 In some cases, even willing recruits would ask the pirates to pretend to force them to sign, so that they could plead they were forced should they ever be captured by the law. Generally, men who had not signed the articles had a much better chance of acquittal at trial if captured by the law. 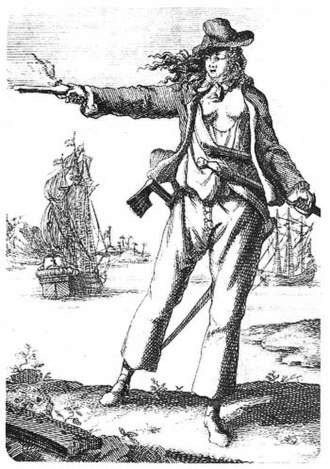 Pirate articles are closely related to, and were derived from, ship's articles of the time, especially those of privateers, which similarly provided for discipline and regulated distribution of booty (though usually far less equally than with pirate articles). 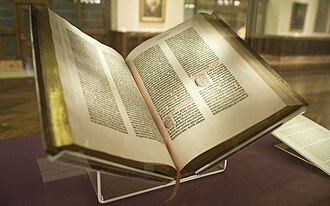 Merchant articles and privateering articles can be traced back to Europe in the Middle Ages when there was a system of "joint hands" agreements between merchants, owners and seamen to share profits. 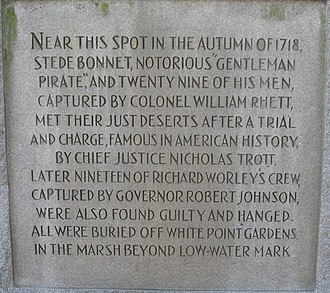 Nine complete or nearly complete sets of piratical articles have survived, chiefly from Charles Johnson's A General History of the Pyrates, first published in 1724, and from records kept by Admiralty Court proceedings at the trials of pirates. A partial code from Henry Morgan is preserved in Alexandre Exquemelin's 1678 book The Buccaneers of America. Many other pirates are known to have had articles; the late-17th century Articles of George Cusack and Nicholas Clough have survived intact. Few pirate articles have survived; pirates on the verge of capture or surrender usually burned their articles or threw them overboard to prevent the papers being used against them at trial. The articles listed below are attributed by the Boston News-Letter to Captain Edward Low. The first eight of these articles are essentially identical to those attributed to pirate captain George Lowther by Charles Johnson. Since Lowther and Low are known to have sailed together from about New Year's to May 28, 1722, it is probable that both reports are correct and that Low and Lowther shared the same articles, with Low's two extra articles being an ordinance, or amendment, adopted after the two crews separated. I. The Captain is to have two full Shares; the Quartermaster is to have one Share and one Half; The Doctor, Mate, Gunner and Boatswain, one Share and one Quarter. II. He that shall be found guilty of taking up any Unlawful Weapon on Board the Privateer or any other prize by us taken, so as to Strike or Abuse one another in any regard, shall suffer what Punishment the Captain and the Majority of the Company shall see fit. III. He that shall be found Guilty of Cowardice in the time of engagements, shall suffer what Punishment the Captain and the Majority of the Company shall think fit. IV. If any Gold, Jewels, Silver, &c. be found on Board of any Prize or Prizes to the value of a Piece of Eight, & the finder do not deliver it to the Quarter Master in the space of 24 hours he shall suffer what Punishment the Captain and the Majority of the Company shall think fit. V. He that is found Guilty of Gaming, or Defrauding one another to the value of a Royal of Plate, shall suffer what Punishment the Captain and the Majority of the Company shall think fit. VI. He that shall have the Misfortune to lose a Limb in time of Engagement, shall have the Sum of Six hundred pieces of Eight, and remain aboard as long as he shall think fit. VII. Good Quarters to be given when Craved. VIII. He that sees a Sail first, shall have the best Pistol or Small Arm aboard of her. IX. He that shall be guilty of Drunkenness in time of Engagement shall suffer what Punishment the Captain and Majority of the Company shall think fit. X. No snapping of Guns in the Hold. Exquemelin writes in general terms about the articles of late 17th century Caribbean buccaneers. Although he does not attribute these articles to any specific buccaneer captain, Exquemelin almost certainly sailed with Henry Morgan as a physician, and thus his account likely reflects Morgan's articles more accurately than any other privateer or buccaneer of the time. I. The fund of all payments under the articles is the stock of what is gotten by the expedition, following the same law as other pirates, that is, No prey, no pay. II. Compensation is provided the Captain for the use of his ship, and the salary of the carpenter, or shipwright, who mended, careened, and rigged the vessel (the latter usually about 150 pieces of eight). A sum for provisions and victuals is specified, usually 200 pieces of eight. A salary and compensation is specified for the surgeon and his medicine chest, usually 250 pieces of eight. III. 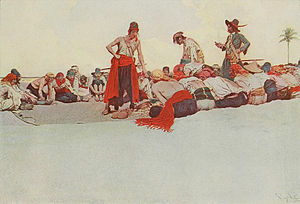 A standard compensation is provided for maimed and mutilated buccaneers. "Thus they order for the loss of a right arm six hundred pieces of eight, or six slaves ; for the loss of a left arm five hundred pieces of eight, or five slaves ; for a right leg five hundred pieces of eight, or five slaves ; for the left leg four hundred pieces of eight, or four slaves ; for an eye one hundred pieces of eight, or one slave ; for a finger of the hand the same reward as for the eye. IV. 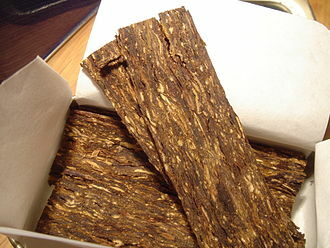 Shares of booty are provided as follows: "the Captain, or chief Commander, is allotted five or six portions to what the ordinary seamen have ; the Master's Mate only two ; and Officers proportionate to their employment. After whom they draw equal parts from the highest even to the lowest mariner, the boys not being omitted. For even these draw half a share, by reason that, when they happen to take a better vessel than their own, it is the duty of the boys to set fire to the ship or boat wherein they are, and then retire to the prize which they have taken." 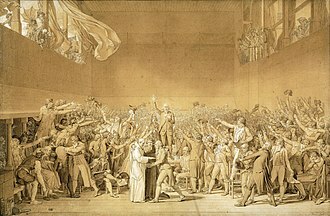 V. "In the prizes they take, it is severely prohibited to every one to usurp anything, in particular to themselves. ... Yea, they make a solemn oath to each other not to abscond, or conceal the least thing they find amongst the prey. If afterwards any one is found unfaithful, who has contravened the said oath, immediately he is separated and turned out of the society." Parley, part of the code according to the Pirates of the Caribbean (film series). ^ Johnson, Charles (1724), A General History of the Pyrates, p. 398 OCLC 561824965. ^ Little, Benerson (2005), The Sea Rover's Practice: Pirate Tactics and Techniques, Potomac Books, Inc., ISBN 1-57488-910-9, p. 34. ^ Sometimes seamen who volunteered to join the pirates asked the quartermaster to go through the motions of forcing them in the presence of their officers. The quartermaster was happy to oblige and do a blustery piratical turn for them, with much waving of cutlasses and mouthing of oaths. Botting, Douglas The Pirates, Time-Life Books Inc., p. 51. ^ Hayes, Peter (2008), "Pirates, Privateers and the Contract Theories of Hobbes and Locke", History of Political Thought 24, 3: 461-84. ^ a b Fox, E. T. (2013). ‘Piratical Schemes and Contracts’: Pirate Articles and their Society, 1660-1730 (PDF). Exeter: University of Exeter. Retrieved 15 June 2017. ^ The Newgate Calendar - JOHN GOW Accessed 16 December 2009. Charles Johnson, A General History of the Robberies and Murders of the Most Notorious Pyrates, London, 1724. 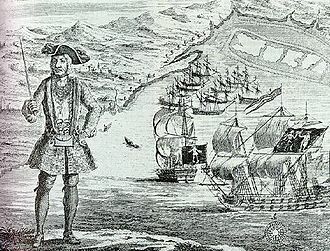 Benerson Little, The Sea Rover's Practice: Pirate Tactics and Techniques, 1630-1730. Potomac Books, 2005. By modern standards, these cannon were extremely inefficient, difficult to load, and short ranged. These characteristics, along with the handling and seamanship of the ships that mounted them, firing a naval cannon required a great amount of labour and manpower. The propellant was gunpowder, whose bulk had to be kept in a storage area below deck for safety. Powder boys, typically 10–14 years old, were enlisted to run powder from the armory up to the gun decks of a vessel as required. A wet swab was used to mop out the interior of the barrel, extinguishing any embers from a previous firing which might set off the next charge of gunpowder prematurely. 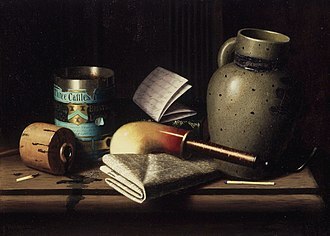 Gunpowder was placed in the barrel, either loose or in a cloth or parchment cartridge pierced by a metal pricker through the touch hole, and followed by a cloth wad, rammed home with a rammer. Next the shot was rammed in, followed by another wad to prevent the cannonball from rolling out of the if the muzzle was depressed. The gun in its carriage was run out, men heaved on the gun tackles until the front of the gun carriage was hard up against the ships bulwark, the barrel protruding out of the gun port. This took the majority of the gun crew manpower, as the weight of a cannon in its carriage could total over two tons, and the ship would probably be rolling. 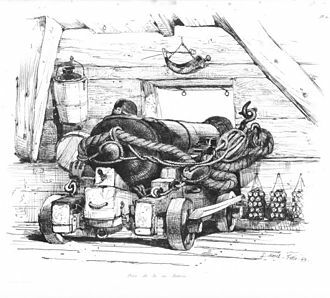 The touch hole in the rear of the cannon was primed with finer gunpowder or from a quill pre-filled with priming powder, the earlier method of firing a cannon was to apply a linstock—a wooden staff holding a length of smoldering match at the end—to the touch-hole of the gun. In 1745, the British began using gunlocks, the gunlock, by contrast, was operated by pulling a cord or lanyard. Despite their advantages, gunlocks spread gradually as they could not be retrofitted to older guns, after the introduction of gunlocks, linstocks were retained, but only as a backup means of firing. 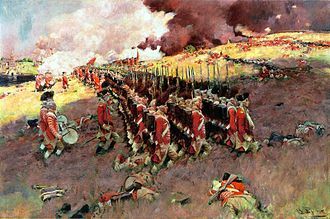 The linstock slow match or the spark from the flintlock ignited the powder, which in turn set off the main charge. 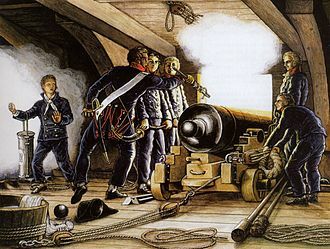 When the gun discharged, the recoil sent it backwards until it was stopped by the breech rope, instead of live fire practice, most captains exercised their crews by running the guns in and out, performing all the steps associated with firing but without the actual discharge. 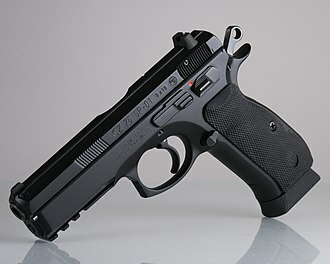 A complete and accurate listing of the types of guns requires analysis both by nation and by time period. 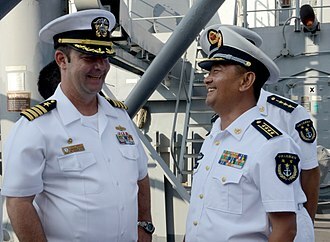 The boatswain supervises the other members of the ships deck department, and typically is not a watchstander, except on vessels with small crews. Additional duties vary depending upon ship and circumstance, the word boatswain has been in the English language since approximately 1450. 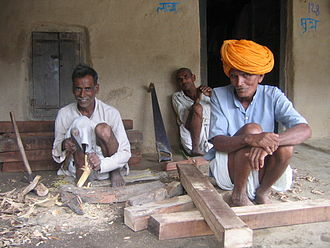 It is derived from late Old English batswegen, from bat concatenated with Old Norse sveinn, meaning a man, apprentice. Directly translated to modern Norwegian it would be båtsvenn, while the actual title in Norwegian is båtsmann. The phonetic spelling bosun has been observed since 1868 and this latter spelling was used in Shakespeares The Tempest written in 1611, and as Bosn in editions. The rank of boatswain was until recently the oldest rank in the Royal Navy, these officers were warranted by the British Admiralty. They maintained and sailed the ships and were the officers of the navy. The Royal Navys last official boatswain, Commander E W Andrew OBE and it is equivalent to the rank of colour sergeant in the army and the royal marines cadets, it is sometimes an appointment for a senior petty officer to assist a coxswain. The boatswain works in a ships deck department as the foreman of the deck crew. Sometimes, the boatswain is a third or fourth mate, a bosun must be highly skilled in all matters of marlinespike seamanship required for working on deck of a seagoing vessel. The bosun is distinguished from other able seamen by the roles, scheduling. 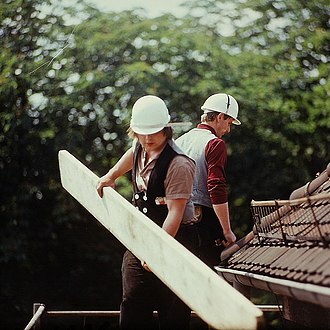 As deck crew foreman, the plans the days work. As work is completed, the checks on completed work for compliance with approved operating procedures. These duties can include cleaning and maintaining the hull, superstructure. 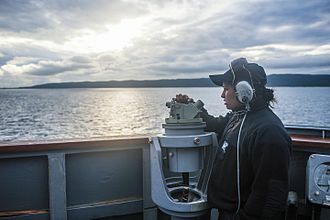 A boatswains skills may include cargo rigging, winch operations, deck maintenance, working aloft, and other duties required during deck operations. The boatswain is well versed in the care and handling of lines, and has knowledge of knots, bends, the boatswain typically operates the ships windlasses when letting go and heaving up anchors. 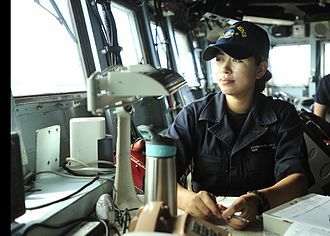 Moreover, a boatswain may be called upon to lead firefighting efforts or other emergency procedures encountered on board, effective boatswains are able to integrate their seafarer skills into supervising and communicating with members of deck crew with often diverse backgrounds. A U.S. Navy quartermaster taking a bearing in 2015. A U.S. Navy quartermaster recording bearings in 2015. Bartholomew Roberts's crew carousing at the Calabar River. Most of the crew were drunk when Swallow appeared. A scan of a 1936 Jolly Roger Cups Pirate card of the pirate George Lowther.